The pullback has started but the fact the market has held above the 1325 support level suggests a mild correction so far. I favor a stronger pullback but if we get another few points off tomorrow then the market will have enough strength to break the 1332 resistance and turn the market officially bullish again. Oil is at $106, which weeks ago caused panic. But there is a sense of faith in the markets right now which works for the bullish case. I plan to go long (especially emerging markets) if we get anything less than a big sell off. 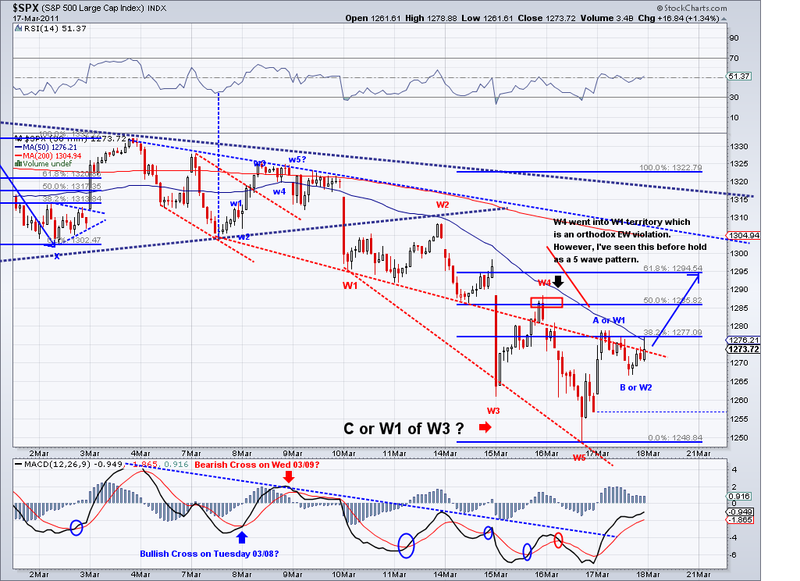 The market completed the W5 and stopped at the 1332 resistance level mentioned yesterday. And now, we should start seeing the correction (or sell off) starting tomorrow or Friday at the latest. 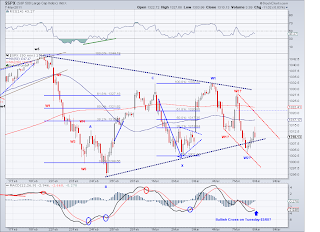 I mentioned earlier this week the 1290 target and that is still a pretty much valid target for this coming bearish wave. 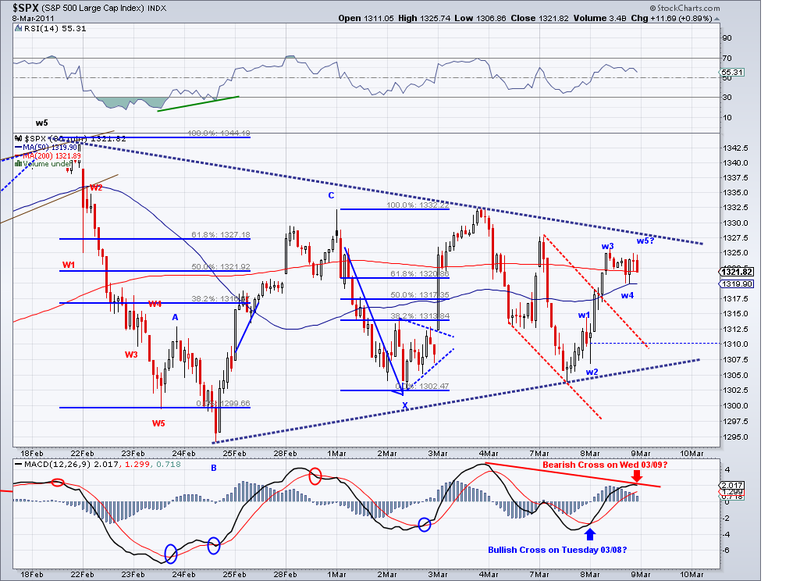 And like I said before, if we get corrective zig zag waves then chances are we are going to see new highs for the year. But if we get there in a big sell off, then the bearish case will be reinforced. The TA is currently at 1305 and rising every day so we should see the TA tested at the very least on this pullback. I sold all my longs at 1331, re-added the short position I covered yesterday and maintaining my original short so I am more than net short at this point. The wave turned out to be a W4 after all and it seems like we're headed towards the 1325 or 1332 before a significant pullback. The volume today was the second lowest this year and this seems to be a window dressing rally. 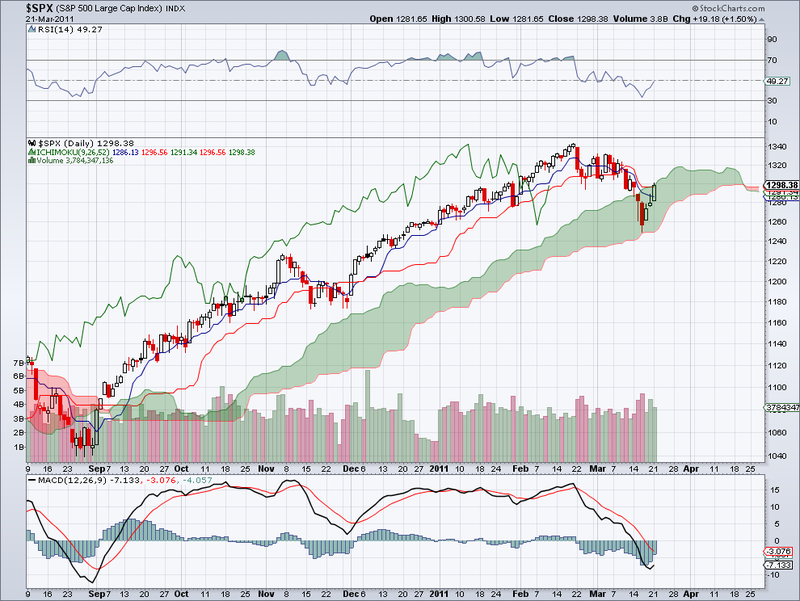 But once the new quarter starts by the end of the week, we should see what the market's intentions really are. I covered the shorts I took at 1318 at a profit but left the 1308 position open as an hedge to my longs. So I'm waiting to see if this has been a sucker rally (from 1250) after all or the start of a new rally to new highs. The market should start selling off (or correcting) around this time. 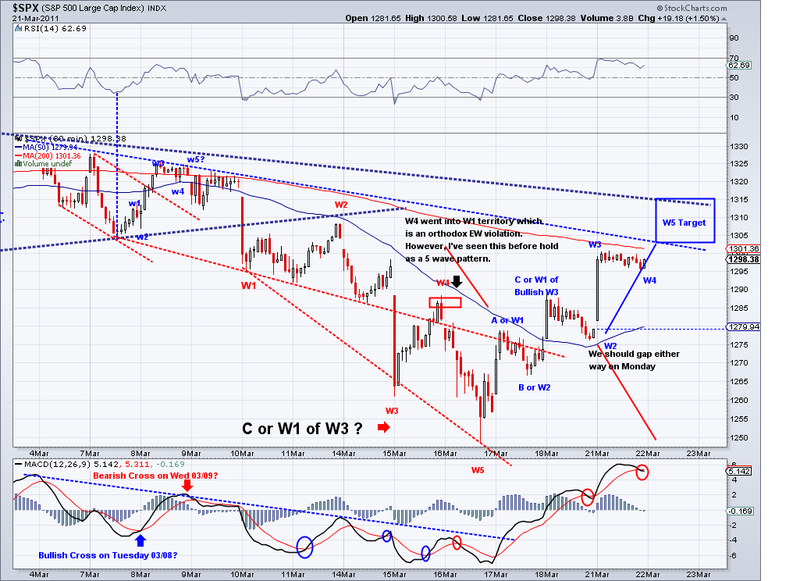 There is a chance that the mostly sideways action is part of a W4 with a W5 leg coming tomorrow or Wed. However, I doubt any new significant highs will be made until we get at least a correction. So I favor a sell off or correction in the next couple of days to the levels I've mentioned before. The key to the structure will be how the market reacts once we are at these levels. If the market holds at support then there is a good chance the bulls will take aim at a new high for the year. I will be covering my shorts on any reversal against the TA which is currently at 1293. If this is a real sell off I doubt the TA will be re-tested again once the market crosses it.. we shall see. The market rallied just like it did in after hours and it stopped at the 1319 resistance and I think we'll see a bearish wave on Monday. I see many people talking about this being a 5th leg to new highs and while this is possible, I wouldn't assume that until the next wave unfolds. We should be able to tell by early next week if this was a counter rally or a the beginning of a new bullish rally. 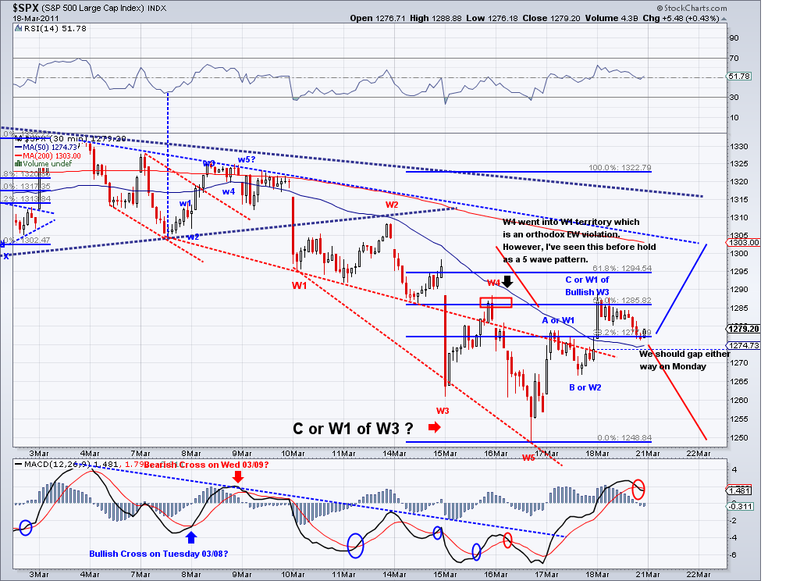 If today was a W3, then the 1300 level should not be violated. I took another short position at 1318 so I am now net short and will be covering when the TA gets tested. I don't know how the market can ignore all the bad news and $105 oil but if it wants to go higher then better prices to sell longs and to short (or preserve cash). The market closed today near 1310 but the 1315 target I posted yesterday has been technically met during after hours trading. I speculated on an Ascending Triangle pattern that completed in the e-minis and we woke up to the trust out of this triangle. And now that the area I had marked as a target has been met and the market is challenging the bearish trendline, I think we could call this enough for a counter rally. Now, what comes next will be the make or break wave for bulls and bears alike. 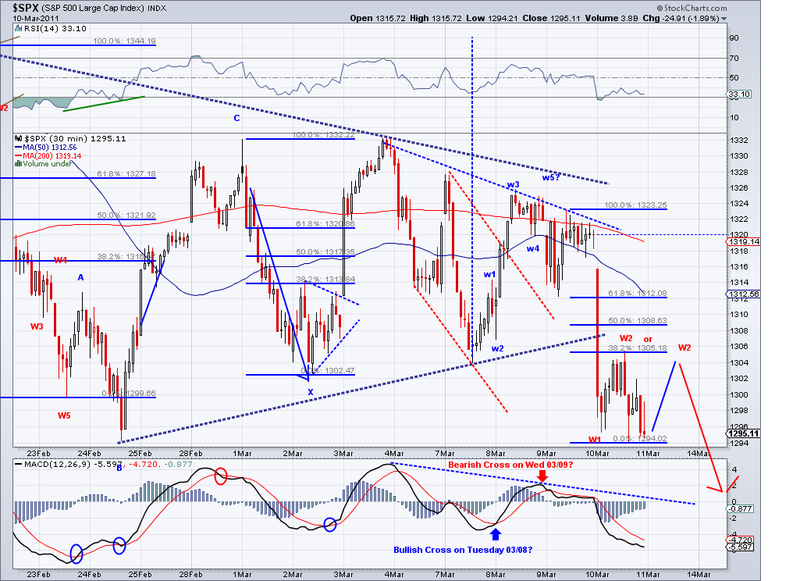 I think we will retrace to test the TA which is currently at 1287 if the bearish wave starts tomorrow. If we get there in a sell off and the 1282 support is broken, then I think there is a good chance we'll see 1220 fairly soon. However, if we get there in corrective waves (zig zag waves), chances are the bottom is in for this correction and we will go on to new highs for the year. I favor the bearish case based on the trendline and the bad fundamentals but I will trade according where the trend takes me. As of today, the TA turned positive and if not reversed soon then the short term will officially turn bullish. 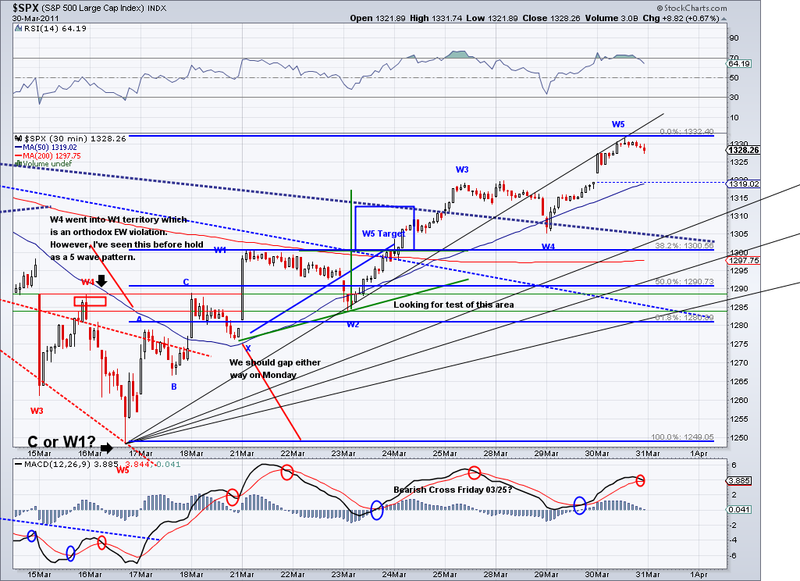 I suspected the high for the rally could be put in after hours so I took a short position at 1308 to hedge. And of course, we might see 1315 or even 1319 in the cash market before reversing but I think we're close enough for the market to start correcting (or selling off). 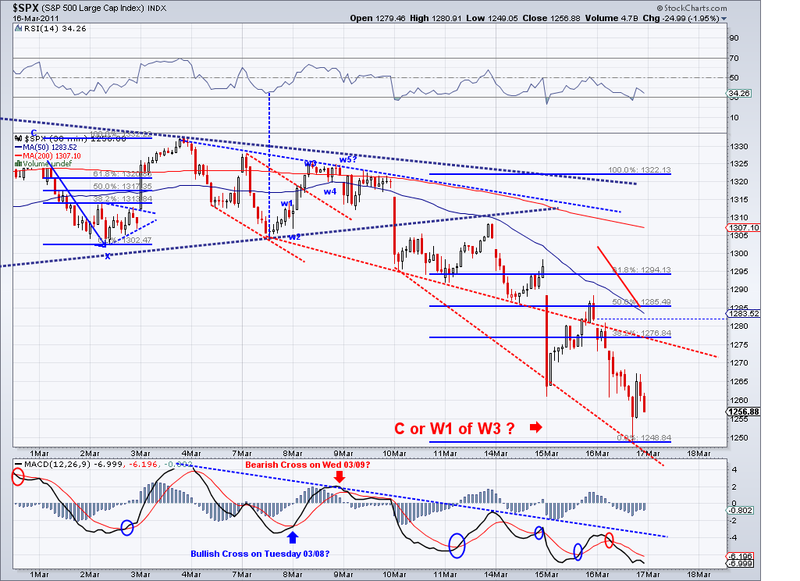 The market retraced into what I originally labeled as W1 so that count is out. However, the market continues to point for more upside before any meaningful reversal. Today's bullish reversal from the early sell off is setting off a potential Ascending Triangle targeting 1315, where the gap is. So I expect a bullish end of the week and then we'll see if the past few weeks was a correction or just the first phase of a much larger sell off. I am waiting for further upside before shorting. 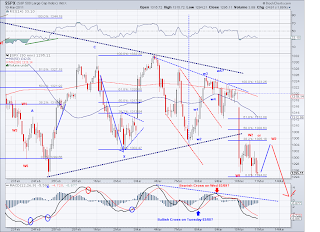 Also, the TA is turning positive so the market needs to resume selling if the bearish trendline is to continue. Today the market just extended the sideways correction from yesterday and I think we should see a break out to the upside tomorrow. There is obviously the possibility of a "failed W5" but so far it seems like the market will be targeting the 1312-1315 area. 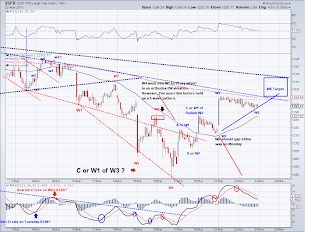 I am waiting for a this W5 to appear to take positions and it will be interesting to see if the larger correction bearish wave resumes then. Oil is getting expensive again and most likely we will see a new high for the year. Also, I see there is talk of a recession in 2013 so sentiment does seem to support the bearish trend. 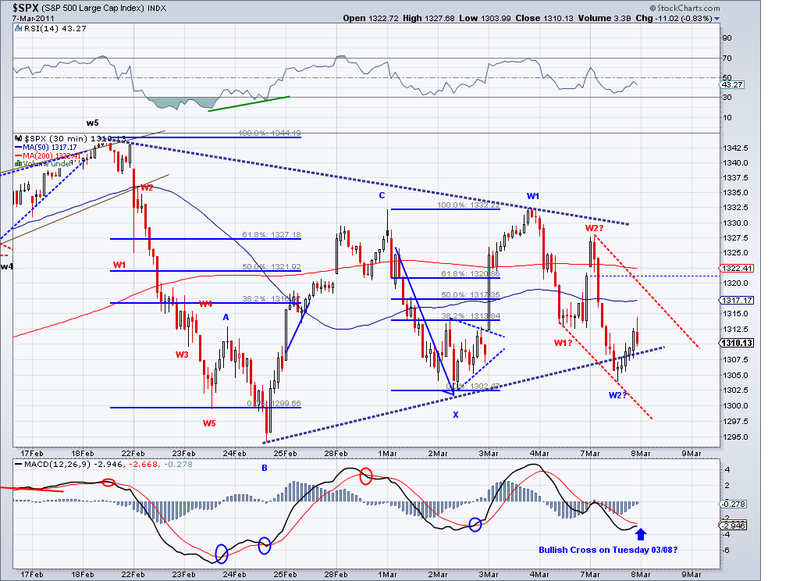 5th Wave to 1302 or 1312? 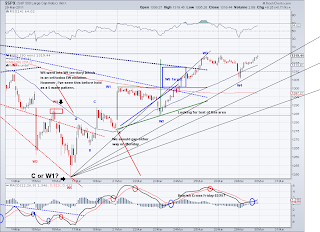 The market gapped as I speculated on Friday and now we have reached the area I initially pointed out as a target area for a counter rally when the sell off started accelerating last week. And in looking at the wave from 1250, I still see room for a 5th Wave that should carry us to the 1302 or 1312 resistance level. My guess is that we will hit the bearish descending trendline which happen to lie around the resistance areas and then go into a strong sell off to a new low for the year or a corrective wave to test the 1275 or 1288 area to then launch a strong bullish wave. So my strategy will be to short this 5th Wave and see if we go down on a strong sell off or we get to the retracement area in a corrective wave. I originally wanted to short at 1294 or 1302 but given the fact that 1294 was obviously going to be taken out and the market eventually went into a bull flag pattern, I held off and I think tomorrow (or when the 5th wave shows up) will be a better day to short. The market's bearish trendline is intact but if bulls can manage to overcome the key resistance levels then the larger correction will have to wait another month or so. Also, today I posted an Ichimoku cloud chart. This chart helps identify support and resistance levels which I find very valuable. Right now it shows the market still within the price objective of a counter rally but any higher closes could turn the market bullish again according to this tool. The market rallied hard in the morning almost reaching the 1290 target I mentioned yesterday. The pattern at the end of the day leaves the possibility of a gap on Monday. 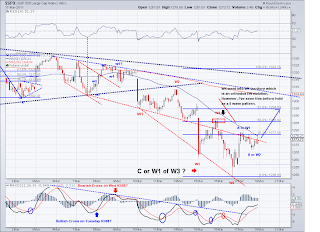 They way I see it, we could have a big gap down in a W1 of a bearish W3 or a bullish W3 of W3. 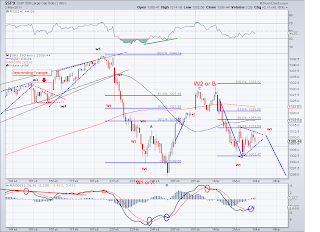 The market came very close to the TA (1292) but it closed below it and there is a bearish crossover on the MACD so the odds favor a bearish wave. 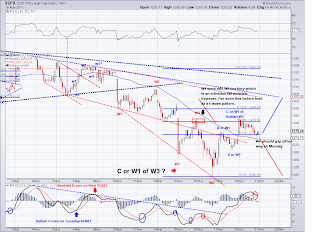 I initially took short positions at 1285 but covered them at the end of the day because the bullish wave did not have a hard reversal as I had hoped and the possibility of a bullish W3 on Monday. I will take short positions again on Monday if the market approaches 1294 or 1302 as these are the resistance levels the market will have to overcome to turn bullish. The 1250 level was breached yesterday but support was regained and the market is now on the counter rally. 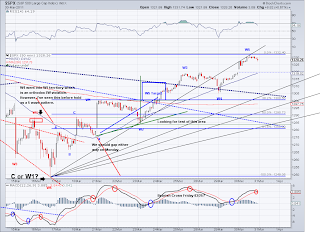 What happens tomorrow (and possibly Monday) should give us an idea if this is an ABC move in preparation for a huge sell off or the beginning of another leg up to 1343. The trend is down and the market is still way below the TA but I think the market will test the TA before showing its true intentions. 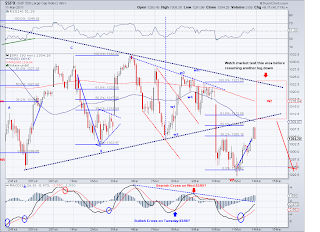 In order for the market to turn bullish again, it needs to recapture and break the TA. Until then, the target is 1220. I will start taking short positions around the upper resistance levels. 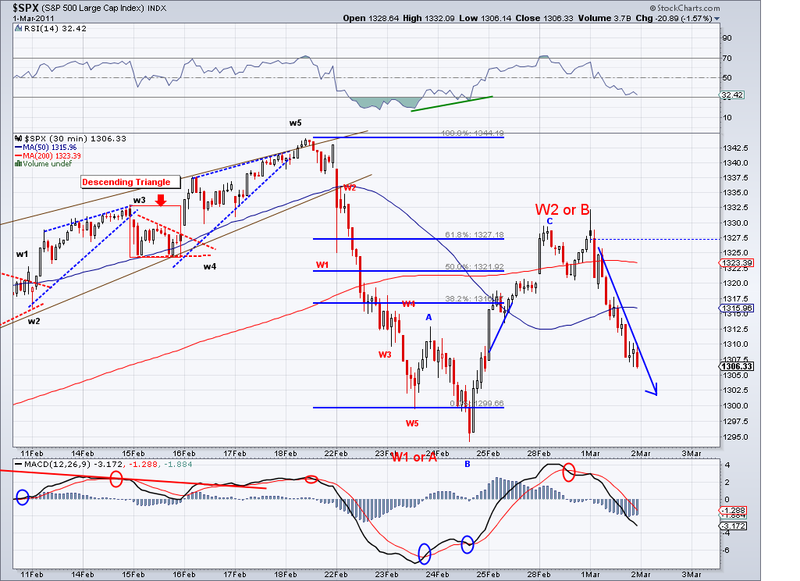 Also, some of you might have noticed that I put a 5 wave label on the recent sell off. 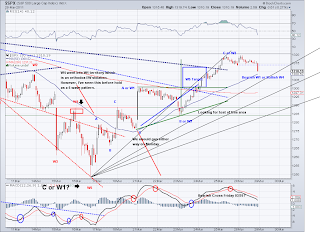 I am doing this to keep a better perspective myself as there is a W4-W1 wave violation which technically should negate the count. I've seen 5 Wave structures before (as in W1-3-5 being impulsive) where this has happened and I think it counts better than assigning it corrective labels as orthodox EW would call for. 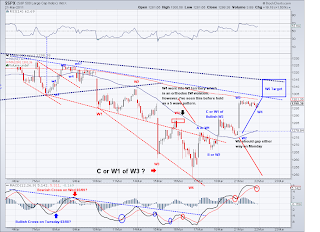 The waves in the market are still hard to read following Elliott Wave guidelines as there are several overlapping impulsive waves. So I will refrain from labeling them since it's hard to predict waves without a proper wave structure. These sort of waves have happened before but they have been seldom and the best I can think of is to label the entire event from 1343 as an ABC or a W123 (with W3 in progress). I was looking for a counter rally but every single attempt by buyers has been failing, therefore there is a good probability that we will reach 1220 faster than I thought. 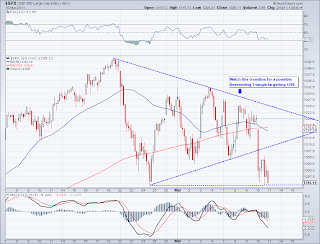 The 1255 support level broke so I think we have more downside to come. I assume we'll see a bounce before then to test the TA at some point but that could be this week or next and that TA is falling fast (currently at 1300). And as tempting as it is to go long to play the bounce, I will only trade short until the TA turns positive again. I am however parking cash/position trading CNY, which is the Chinese Remimbi ETF. Also, please note my post earlier on Japan. Help those in need if you can. I don't particularly like profiting for catastrophic events but Japan will recover eventually from this disaster and so will its stock market. I will take positions in EWJ and will post entry positions on here. And if you wish to profit from it or just want to help victims of the tsunami and the earthquake, consider making a small donation by texting the numbers below from your cell phone. I will add charts for the S&P later today. Verizon Wireless has started a mobile giving program where customers can contribute to the relief efforts. All you have to do is send a text message. There are a number of organization you can give to including the American Red Cross, the Salvation Army, and Global Giving. Each organization has its own word to text, and number to text to. Once you send the text, ten dollars will be donated to the organization you chose. 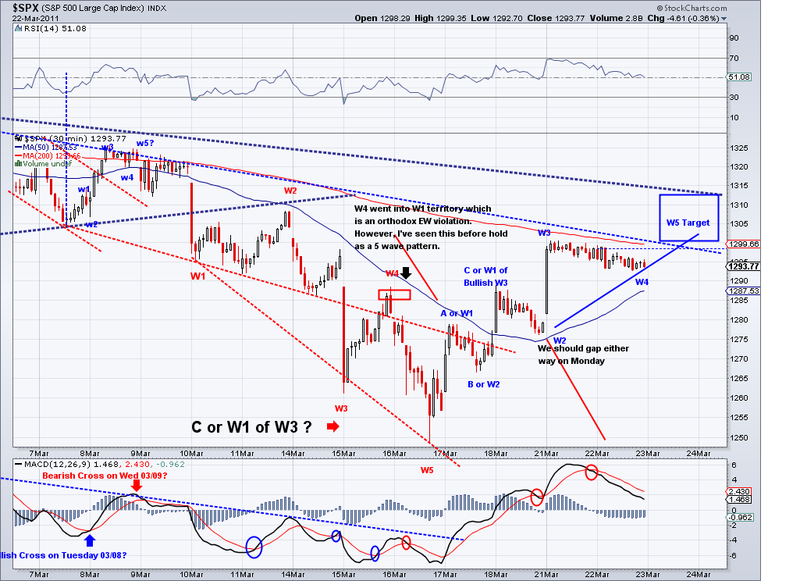 C Wave or Bearish Wave 1 of Wave 3? The action in the cash market makes it hard to get a good EW read. 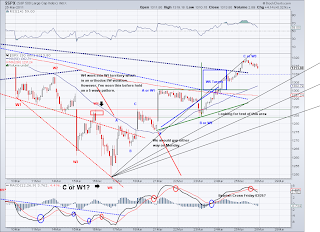 However, the market sold off to the levels that I had posted yesterday and in turn satisfying my original target for a correction I posted on February 25th where I mentioned 1280 as a target. Now the big question is whether this is a correction of a larger degree or are we done now with the C wave I mentioned in late February. And I think we will get the answer in the next couple of sessions. 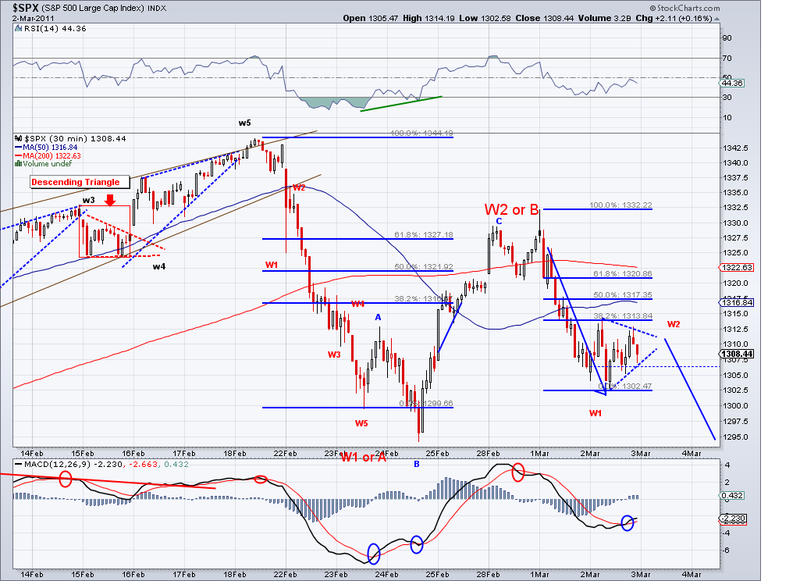 The market will either retrace to a Fib area and then sell off HARD or we will rally now to a high above 1343. 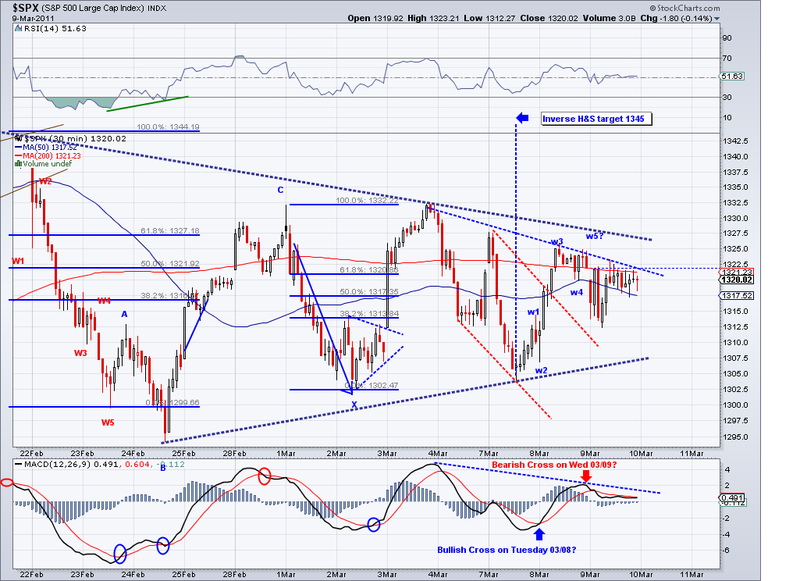 I lean towards a rally to test the TA just above 1300 and then the bearish wave should give us a clue. Normally, I would have gone long this morning as the market failed to take out the 1255 support. But I am cautious and rather add shorts after this counter rally is done. There is talk now of things not being as bad, blah, blah.. which is what is needed for a counter rally. Once this rally is over, we'll probably go into mania mode or panic.. So we got the sell off earlier than I had expected but perhaps what we saw today could be counted as the bearish 5th wave as opposed to the one on Thursday. So I am still looking to a retrace to the area on the chart to test the bearish trendline/TA and then resume another 5 waves down which should take out the 1275 support. 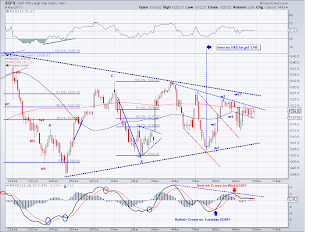 The next support after 1275 is 1255 but in all, I am looking for a correction to the 1180-1220 area before bottoming. Obviously, it is too early to tell as we could still put in another leg up for a new high for the year but probabilities are now low. As long as the market keeps under the TA, stay in cash or stay short. I sold longs on Friday to lock in profits in case we had a sell off like the one we had today but I still have another batch to sell when the market retraces. The short term movements of markets work on sentiment more than they do on economic facts and all these negatives should send sentiment to an extreme oversold condition eventually (perhaps this summer?) and then will be a good time to buy. The guys who were buying in February will probably be selling by then, it's unfortunate (for them) but this depression/mania cycle is actually predictable. Selling to Resume Next Week? The market bounced back as I expected but 1294 support did not hold so the Descending Triangle pattern is out. I think the counter rally will continue on Monday (and perhaps Tuesday?) until it hits the rectangular red area on the chart. 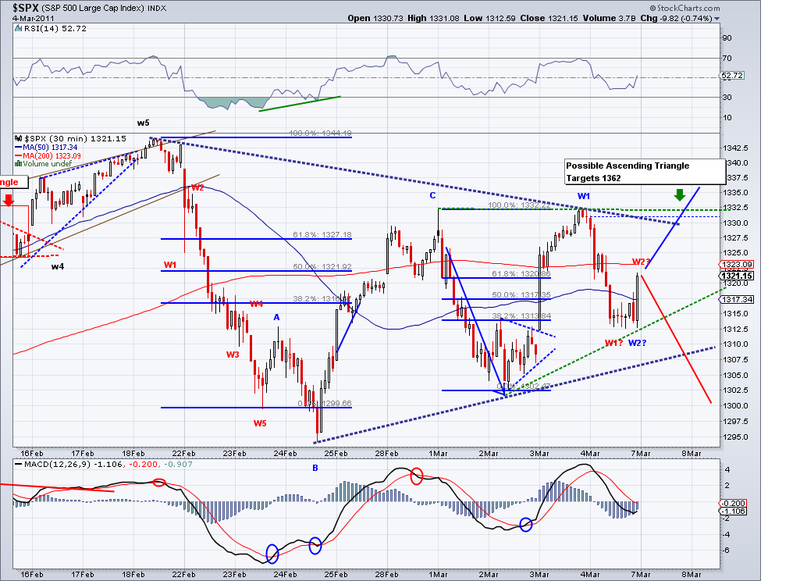 There lies couple of trendlines the market will most likely test, the Trend Average and the 1313 resistance. So I am assuming the market will reach this area and resume another leg down that will challenge and most likely break the low put in today. I think the main level many traders will be watching is the 1275-1280 area, this level must hold if the bull market is to resume. I sold all the longs I bought at 1295 and will be selling more long positions as we approach the TA and then turn net short again. The only way I will change my mind about another leg down is if we get a very bullish wave to repair the damage done yesterday. With general sentiment down due to global turmoil, gas prices and now the earthquake in Japan. 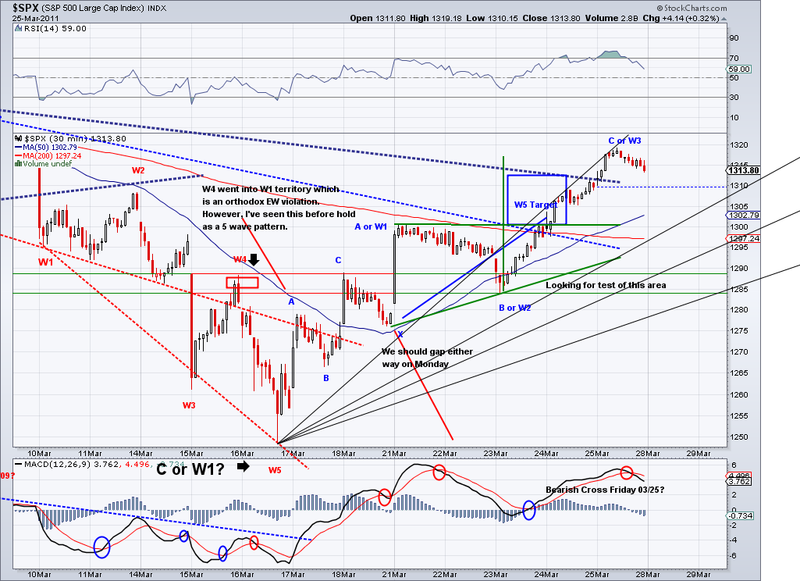 I think the most likely outcome is a prolonged correction. One article I found important today was JP Morgan's cutting GDP forecasts. To me it is the obvious outcome of oil at these levels in an economic recovery and I think this will eventually show up in stock prices as well. So perhaps stock buying mania (like 2 weeks ago) will be back soon but the economy will be facing challenges later this year and it is better to be alert than be blinded by optimism. The market finally made up its mind and it was to the downside and in the process it invalidated the Inverse Head and Shoulders that was forming yesterday. Using my common sense would have been better this time for trading as there were too many negative and unknown factors for this week. 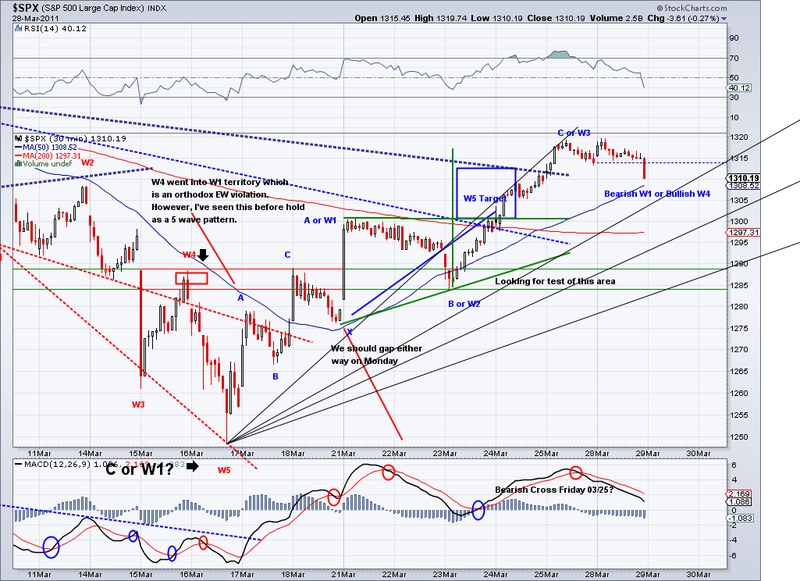 However, I simply could not stay short after seeing yesterday's pattern and as a trend trader. 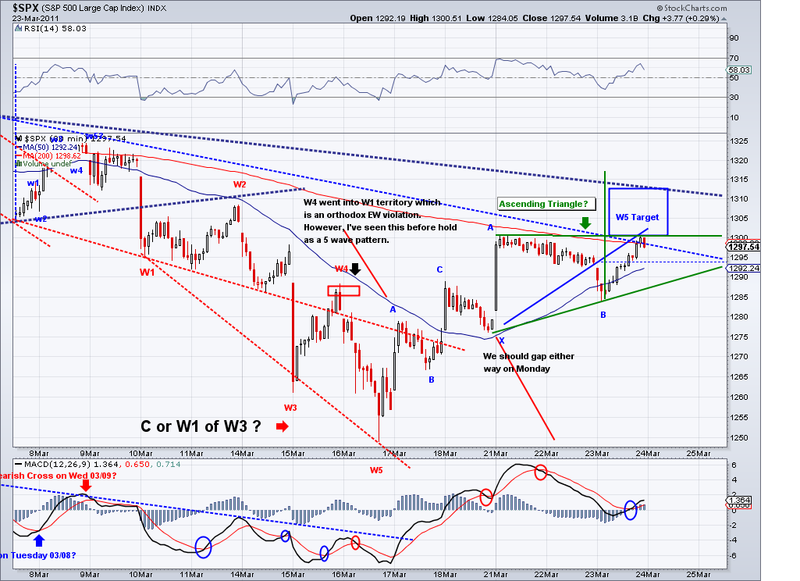 But now that we got the trust out of triangle, I will be looking to enter shorts at or near the Trend Average. 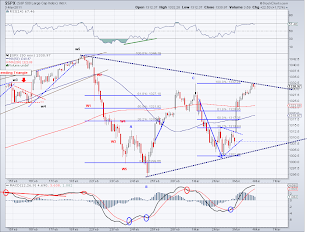 I am assuming what we saw today was a W1 of a new bearish wave, so I am expecting a counter rally to test the TA and/or the bearish trendline from the Triangle. If the market can not get over that trend, there will be a Descending Triangle in place targeting 1250. So we should get a better idea of how the markets will unfold on the coming counter rally. In order for bulls to repair today's damage, the market must get over the TA and break the bearish trendlines. As of now, the downtrend that started couple of weeks ago remains intact and will be solidified by breaking of the 1294 support. I went long today at 1294 betting support will likely hold or at least be re-visited on the counter rally. But I am going short at the end of the coming rally unless the TA is re-captured. 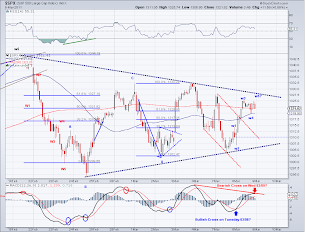 The market keeps closing inside the Triangle pattern but soon we will see a break out from it. Today the market sold off initially but quickly bounced back, forming the right shoulder of an Inverse Head and Shoulders that targets 1345. 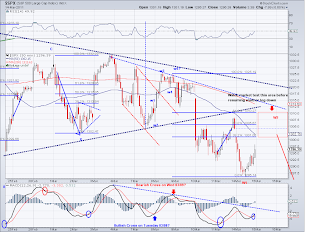 So if this support for the right shoulder holds, the most likely outcome is a bullish trust out of Triangle. I ended up covering my shorts at a small profit after seeing this pattern forming and unless the pattern gets invalidated, I will stay on the long side. I still think the market is being oblivious to obvious problems to the economy as a result of high oil prices and Middle East turmoil. 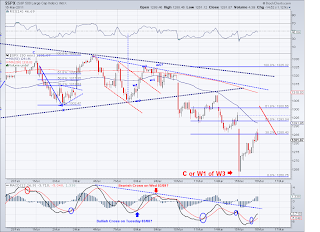 But I since trade with the trend, I am putting my personal opinions aside and going with the charts. The right shoulder of an Inverse H&S was formed this morning. 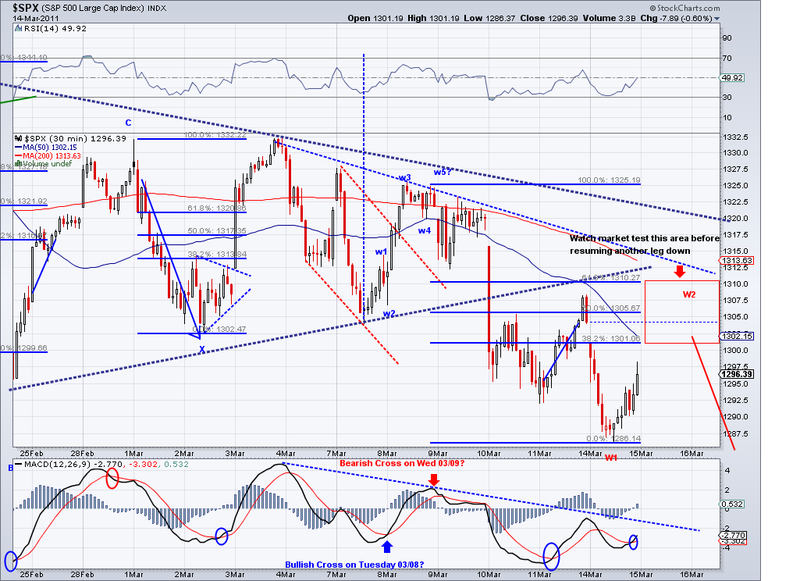 Unless the market falls back soon, watch any break of 1325 as a sign of a break out. I will add more on this later. I am out of my shorts at a small profit. The triangle that started couple of weeks ago is nearing its end and soon we'll see a trust out of the pattern. Today the market rallied to above 1325 as I speculated yesterday and we could see the market roll over again tomorrow or Thursday. I went short again at 1322 because of the possibility of the 5th wave getting truncated and because of the coming Saudi Arabia protests. 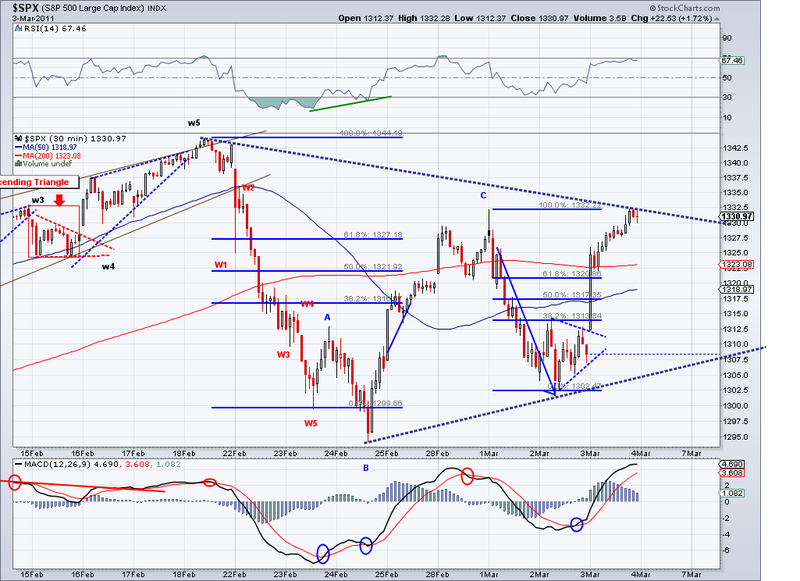 I think the market will use the oil excuse to sell off hard to test 1280. What the market does after that sell off will give us a clue on whether the market is done correcting or it is just beginning a bigger sell off. 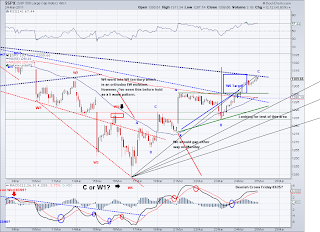 On a side note, Gold has gone up over 5% since I first posted a bullish sign on Feb 21st and it is about to retrace. Once the retrace is done, it will be a good time to add more as I believe Gold will keep on going up. Also, emerging markets are flashing a buy signal as well right now. Sucker Rally or just a Correction? 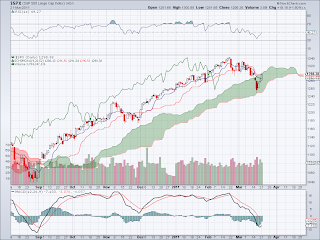 The market continues to be volatile and it continues to triangulate and setting what might be another leg up. However, we've seen several rallies in the past few sessions get quickly reversed in higher than average volume. So it remains to be seen how the next bullish wave unfolds. Usually when up days are in low volume and down days are in heavy volume, it indicates distribution by institutions to smaller players. So there is the possibility the last 3 rally attempts have been "sucker rallies". It's hard to tell as long as the triangle is in place but the oil problem is not about to go away. And today I saw for the first time headlines on the mainstream news on the Day of Rage in Saudi Arabia I first mentioned over a week ago. So the catalyst for a really big sell off is very obvious. The market closed under the Trend Average and the market based on price action is looking bearish. 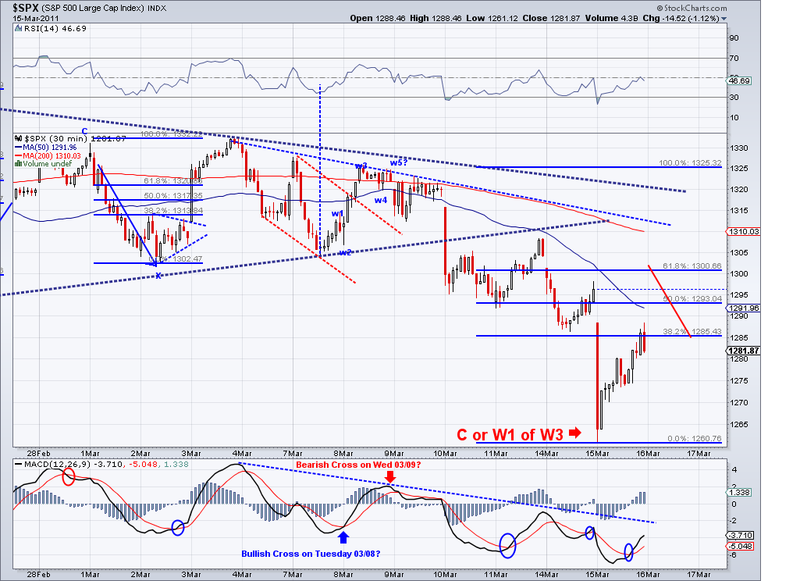 However, I covered my shorts at 1307 today and will re-enter at a higher price. I suspect we're going to get one more rally to 1325+ and then plunge on the "news" from Saudi Arabia. Another 10-20% spike in oil should bring some sense into investors who have not discounted the oil problem. Market Resilience or Blind Optimism? The title of the post summarizes the question most people are asking themselves right now. Oil is almost at $105 (up almost 25% in 2 weeks) and employment numbers did not come up as strong as most analysts were predicting, yet we had a mild sell off. I mentioned volatility common at tops and we are seeing that right now but as it stands, the market could put in a break out wave to 1360 or collapse as soon as Monday. 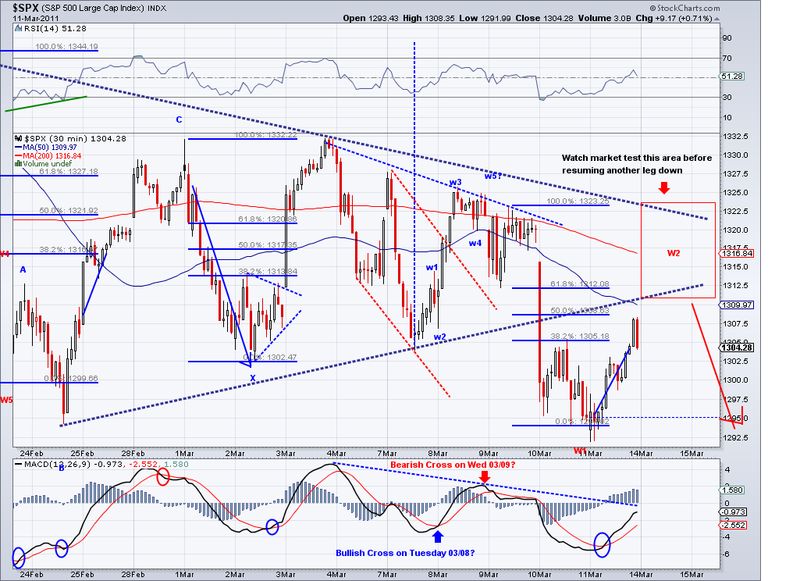 There is an Ascending Triangle in place that targets 1362 and the close today was above the Trend Average. So there is a good possibility for a bullish wave. 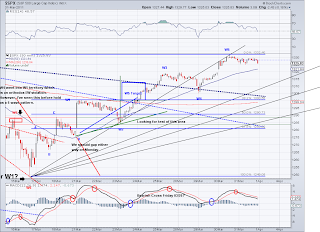 At the same time, there is a 1-2 wave count that points to a sell off so we will have a better picture early next week. I pared down my shorts at the low today but I'm hedged altogether. Sooner or later people will realize $100 plus oil is going to stop the recovery. I pumped my first $4 per gallon gas today and soon gas prices are going to be all over the news and it will be interesting to see how the market will handle it. The rally today was the least likely scenario out of the options prior to the sell off. 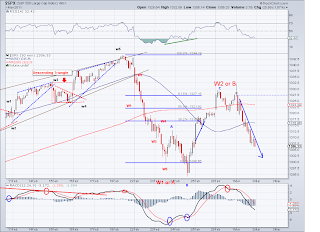 The market invalidated the 5 waves down I was expecting and instead it seems to be triangulating again. 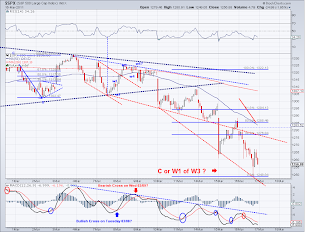 There is also the possibility that this is still Wave B, so the market is unpredictable with all this volatility. But I think we can follow the Triangle lines to see if the market respects it and see how it closes again tomorrow (1333 is resistance). 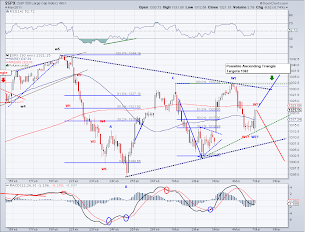 Also, there is a possibility for an Ascending Triangle but it is too early too tell. The last time the market turned volatile and crisscrossed the Trend Average in this manner was the correction in November when it reached a top. 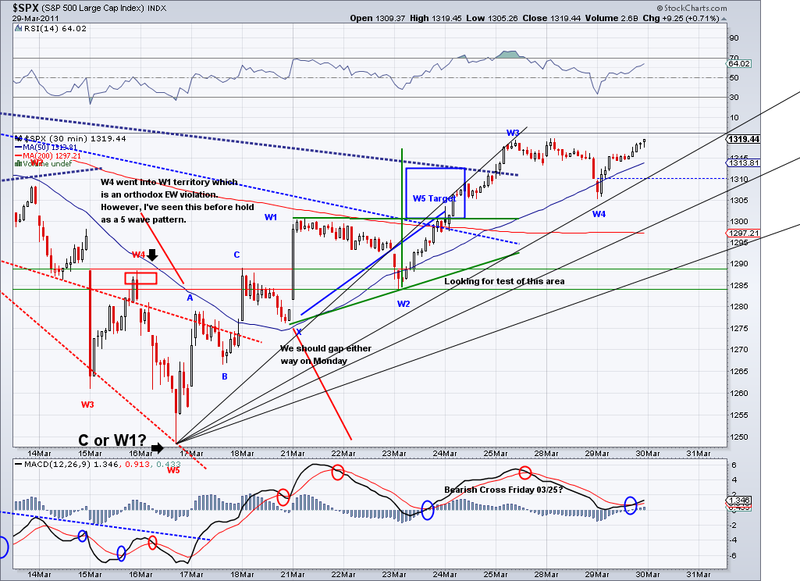 I think the catalyst is as obvious and clear so I think we can expect further wild swings in the next few sessions. I am overall net short with some long positions. The market bounced in what seems to be a W2 within the W3 or C wave so once the Triangle ends I expect the sell off to continue (a big sell off). There is however another way to look at this wave and consider the Triangle a W4 so we would just get another small leg down to test 1294 and then correct on a W2 wave. 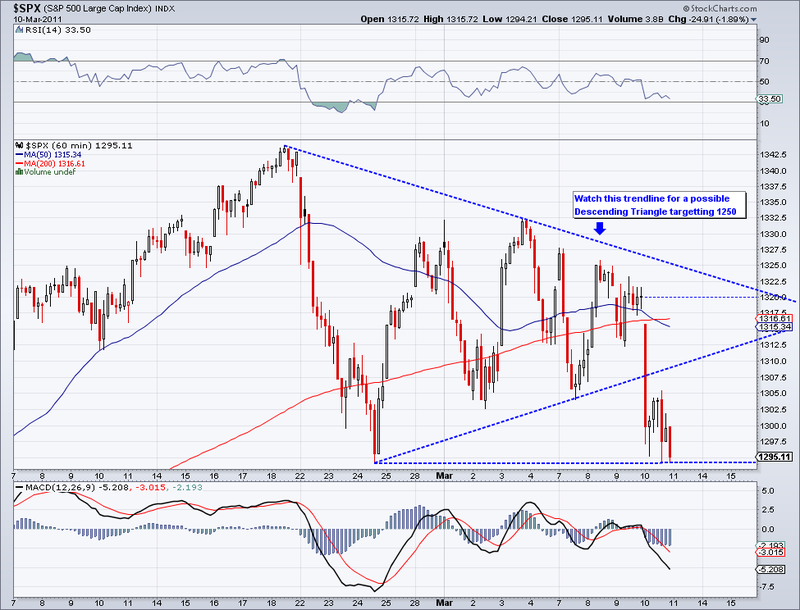 The trend is down and the market is under it, so I am expecting lower lows until the TA gets recaptured. Also, oil shot up over $102 and this will be reflected in gas prices few weeks from now. So any gains in employment or GDP are basically in jeopardy because gas prices serve as an indirect tax and in turn hinders growth. And if the Saudi Arabian oil supply goes into turmoil, the risk of another recession rises substantially. Also the Libya situation looks like it's going to last a while so oil will probably keep on rising. C Wave or 3 Wave? the Middle East is chaotic and Saudi Arabia has protests on the horizon. And I find it interesting no American media outlet has mentioned the "Day of Rage" scheduled on March 11th in Saudi Arabia. I think the best move for traders is to be in cash or short at this point until the trend changes again.